Photographs of Vector Architects’ Seashore Library bring to mind stories of desert islands, pirates and shipwrecks on solitary beaches. The Seashore Library is a new building, but it looks as if it has been part of its natural surroundings for many years, as if time, the wind and waves and the sun have moulded it out of the earth itself. Despite the dreamlike, surreal definition “library on the beach”, the construction contains no visual conflicts, but a harmony of materials, compositional development and spatial results, so that the construction appears to belong to the site without triggering any reaction of rejection. 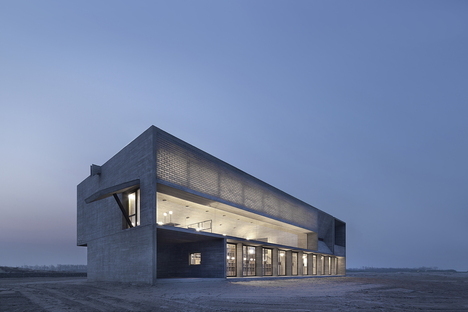 Vector Architects’ Seashore Library is part of a holiday residential complex on Bohai Bay in Beidaihe New District. 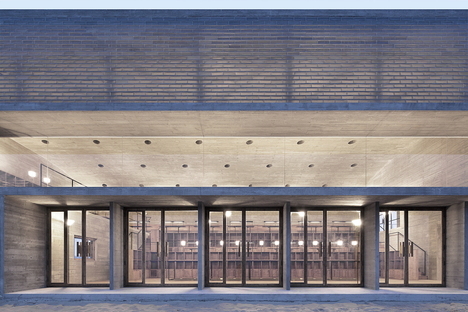 The real estate project includes cultural and leisure facilities, a hotel in a golf course, a restaurant and a coffee shop which are both still under study, and even a chapel recently built right on the beach, all projects by Vector Architects. 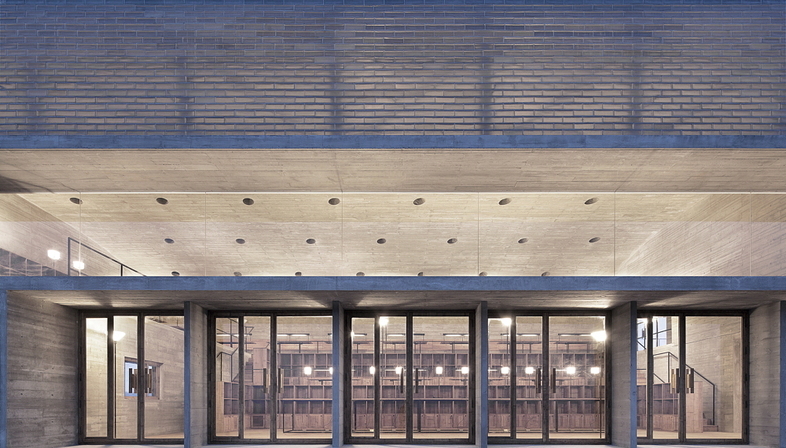 The colour and material of the sand itself seems to demand a concrete structure, underlined by the print and the roughness of the wooden formworks and by a natural finish with no further treatment. Concrete takes a form that appears monolithic from far away and appears colossal when approached but leaves glimpses of the material: openings in the roof that can be widened to improve ventilation, cuts in the western wall of the meditation room and the eastern wall of the platform outside, windows through which to observe the movement of the sun or the ocean waves. 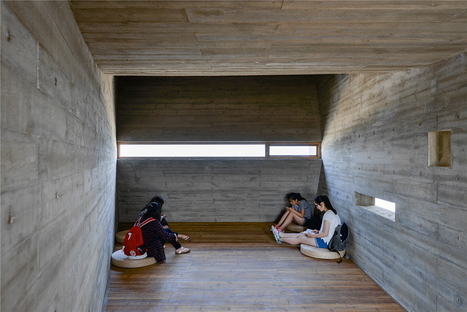 The “view” from the building is entirely oriented toward the sea, lost in contemplation of the ocean like a person totally absorbed in a book. It is a C-shaped volume open to the east, where the glass façade is interpreted in three different ways: on the ground floor, ten double glass doors break up the view, which opens up in all its breadth on the first floor, with a wall made entirely of glass, which is in turn topped by a wall of glass blocks. Special attention was paid to construction of the last block, developed by Vector Architects with a small local producer who made all the bricks by hand. 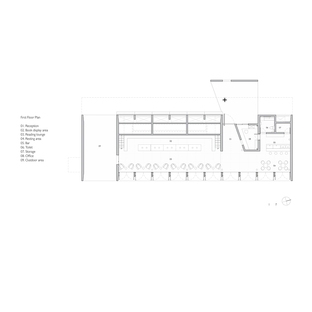 The aim was to achieve a certain translucency that would attenuate the rays of the sun at the hottest time of day, while partially concealing the steel frame that supports the entire weight of the concrete roof, without requiring any pillars interrupting the broad space of the big reading room. The view that best reveals the imposing size of the space is the cross section, revealing the curve that starts on the western wall and continues in the roof, another big C. It thus forms a gap under the roof to insulate from the sun’s rays while completing the shell protected against the world that is this simple library. The world outside is visible here and there, but the reading room is like seating for an audience watching the show put on by the ocean. 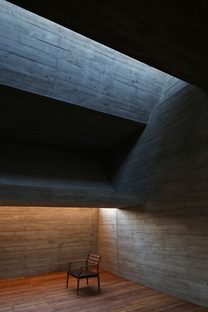 The wooden fixtures and furnishings are simple and complementary to the structure, defining and attenuating the footprint of the concrete, recalling Louis Kahn’s example in the Dhaka Parliament.